Egypt’s coup was not just a major shock for Mohamed Morsi, but also for the Middle East’s most successful Islamist party: Turkey’s AK party. When news of the Egyptian army’s deposing of Morsi broke, Turkey’s prime minister, Recep Tayyip Erdoğan, cut short his holiday on the Aegean coast and convened a crisis meeting of senior ministers. Over the following days Erdoğan strongly condemned the coup, calling it the “killer of democracy and the future” and referring to Egypt’s “so-called administration”. Why does the coup matter so much to Erdoğan’s AK party? One problem is that the Egyptian coup upsets the AKP’s vision of exporting its brand of populist democratic Islamism throughout the Middle East. The AKP saw the Islamist parties that were elected after the revolutions in Tunisia and Egypt as following its lead, and cemented this connection with aid – including training and equipment for Tunisia’s police and a $1bn loan to Egypt. Erdogan has cultivated an impressive profile in the Middle East, and now tweets in Arabic more often than in Turkish. Meanwhile, Morsi held up the AK party as the model for a democratising Arab world in his address to the party’s congress last autumn. Erdogan’s role as self-appointed mentor chimed with the AK party’s “neo-Ottoman” approach to foreign policy that positioned Turkey as a regional power. The AKP also downplayed the scale of popular opposition to Morsi, and presented the coup as a plot hatched by the Egyptian generals. And it used the coup as a metaphor to discredit Turkey’s Gezi Park protest movement. Some drew a direct connection: Hatam Ete of the pro-AKP thinktank SETA tweeted that “what was attempted in Turkey has succeeded in Egypt”. Such conspiracy theories are the legacy of years of oppression of Turkish and Egyptian Islamists by the military-backed secular establishments. But the problem for the AKP and the Muslim Brotherhood is that their paranoid style is now losing its resonance outside their bases. The narrative of victimhood stopped attracting broad sympathy once they moved from persecuted opposition to power. The uncomfortable truth the AKP does not want to accept is that the massive protests that preceded the coup represented a broad-based rejection of Morsi’s policies. It should acknowledge this fact, and recognise that it was not political Islam the protesters rejected. Although many of the individual protesters are hostile to political Islam, others are Islamists. Neither do the Gezi Park protesters want to exclude Islamism from Turkish politics. What both movements reject is an aggressive majoritarian understanding of democracy, according to which the election winner takes all and imposes his agenda on the rest of society. The protest movements, by contrast, insist that vibrant opposition is as important a part of democracy as an elected government. The protesters’ key demand was to be taken seriously and listened to. The demonisation of opposition as the work of mysterious foreign forces, by both the AK party and the Muslim Brotherhood is therefore not just a misdiagnosis of the problem, it is the problem. Tunisia shows a different way forward for democratic Islamists. The Islamist Ennahda party, elected in Tunisia after the first revolution of the Arab spring, has also publicly opposed the Egyptian coup. But despite the similarity between Tunisia and Egypt, the coup is less threatening in Tunis than in Ankara. Some of Ennahda’s opponents have formed a tamarod (rebel) campaign in imitation of Egypt’s, but have had limited success. 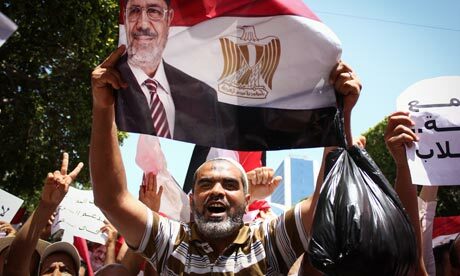 Unlike Morsi, Ennahda has not attempted to use a narrow poll victory to implement an aggressively partisan agenda, instead governing in coalition with two centre-left secular parties, Ettakatol and the Congress for the Republic. The relative success of Ennahda, despite potentially divisive disagreements over the place of Islam in the constitution, shows the value of this inclusive approach. The dismissal of opposition as unpatriotic, and the presentation of political struggle as a zero-sum conflict between Islamism and secularism, adopts the narratives of the old regimes in both Turkey and Egypt, but with the roles reversed. Political Islam remains a powerful political force with a large constituency. However, the large, legacy Islamist parties face trouble if they attempt to use their plurality of votes to steamroller opposition. A common thread running through not just the Arab revolutions but recent protest movements worldwide is the demand for a plural political sphere. If democratic-Islamist parties are to avoid alienating their opponents, they must respond to this. This entry was posted in Essays, News and tagged Egypt, Tayyip Erdoğan on 16 July 2013 .